Move aims to accelerate broadband speeds with fiber optic investments for both home and business owners. Crestview Cable Communications has built a strong high-speed data, digital video, and voice service company, and worked hard to expand broadband capacity in Central Oregon. 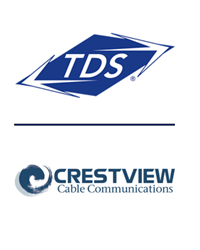 TDS Broadband Service LLC, a subsidiary of Telephone and Data Systems, Inc., (TDS®) and operated by TDS Telecom, announces the signed purchase agreement for Crestview Cable Communications in Central Oregon. The agreement was signed on Aug. 3, 2017. Once complete, the deal will add more than 21,000 service addresses to the adjacent BendBroadband system acquired by TDS in 2014. “Crestview Cable Communications has built a strong high-speed data, digital video, and voice service company, and worked hard to expand broadband capacity in Central Oregon,” states Jim Butman, Chief Operating Officer at TDS Telecom. “With plans to immediately invest and further expand our fiber-to-the-home (FTTH) footprint in key communities such as La Pine — along with accelerating broadband speed upgrades and modernizing video products and services in Prineville and across the larger Crestview footprint, we are confident this transaction will benefit the communities Crestview serves,” adds Butman. BendBroadband and Crestview Cable Communications have a long history of cooperating to improve communications services across the area. Network improvements by TDS will result in additional commercial services being developed and offered to local businesses. TDS’ investments will allow the Central Oregon region to continue growing as an exciting entrepreneurial and high quality of life destination. Founded in Madras, Oregon in 1955, Crestview Cable Communications grew through acquisition to serve Madras, Prineville, La Pine, Metolius, Crooked River Ranch, and Culver, Ore. With a continued focus on upgrading facilities, Crestview offers high-speed broadband with services up to 100 Mbps, maintains an all-digital video network, and offers consumer and commercial voice services to more than 21,000 service addresses. Pat Thompson Co. assisted Crestview Cable Communications with this transaction. Terms of the agreement will not be disclosed. The deal is pending regulatory approval at both the federal and local levels. TDS Broadband Service LLC, a wholly owned subsidiary of Telephone and Data Systems, is a growing force in the cable industry. With more than 300,000 customer connections, TDS Broadband Service provides cable TV, broadband internet, and phone service to customers in Arizona, Colorado, Nevada, New Mexico, Utah and Texas. BendBroadband, located in central Oregon, is part of TDS Broadband Service. Visit helloTDS.com or BendBroadband.com. TDS Telecommunications Corporation (TDS Telecom), headquartered in Madison, Wis., operates OneNeck IT Solutions LLC and BendBroadband, which is part of TDS Broadband Service LLC. Combined, the company employs more than 3,400 people. Visit tdstelecom.com. Telephone and Data Systems, Inc. [NYSE: TDS], a Fortune 1000® company, provides wireless; cable and wireline broadband, TV and voice; and hosted and managed services to approximately six million customers nationwide through its businesses U.S. Cellular, TDS Telecom, OneNeck IT Solutions LLC, and TDS Broadband Service LLC. Founded in 1969 and headquartered in Chicago, Telephone and Data Systems, Inc. employs more than 10,000 people. Visit tdsinc.com.